When H5N1 began its great diaspora in 2005 the virus quickly spread from a handful of South East Asian nations to more than 60 countries, including parts of Europe, the Middle East, and Western Africa. In October of 2005, H5N1 was reported in Turkey, followed a month later by Kuwait, then Iraq and Iran. By February of 2006, in H5N1 was reported in Egyptian Poultry. Outbreaks in poultry are so common in Egypt that the OIE stopped requiring immediate notification (or weekly follow up reports) years ago. Egypt joins mainland China and Indonesia in that regard. 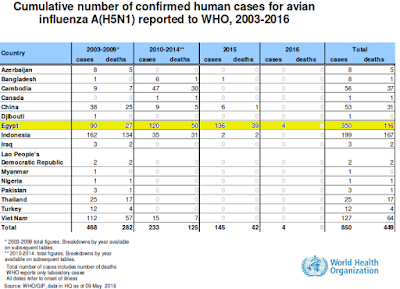 This past winter and spring, the number of H5N1 infections reported by the MOH has dropped markedly, but in recent weeks the Egyptian media has been filled with dire reports of huge losses in poultry. Egypt - High price of chicken due to bird flu says head of poultry producers union - May 29, 2016 H5N1? Counterfeit or not, Egypt has a long history of relying on old, often ineffective vaccines to control H5N1 (see 2012's see A Paltry Poultry Vaccine). 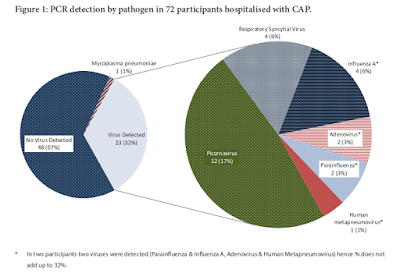 In Eurosurveillance: Emergence Of A Novel Cluster of H5N1 Clade 2.2.1.2, we learned that the predominant H5N1 virus in Egypt had changed in mid-2014, just months before the steep rise in human cases began, raising additional questions about the effectiveness of the vaccines in use. Although it isn't clear what vaccine (or vaccines) will be used, or how effective they may still be. As we discussed last year in The HPAI Poultry Vaccine Dilemma, poorly matched or inconsistently or haphazardly applied avian flu vaccines have been linked to driving vaccine-escape flu variants. Which brings us to one last story, making the rounds in a number of Arabic news sites overnight that suggests Egypt is testing for the H5N8 subtype of avian flu. 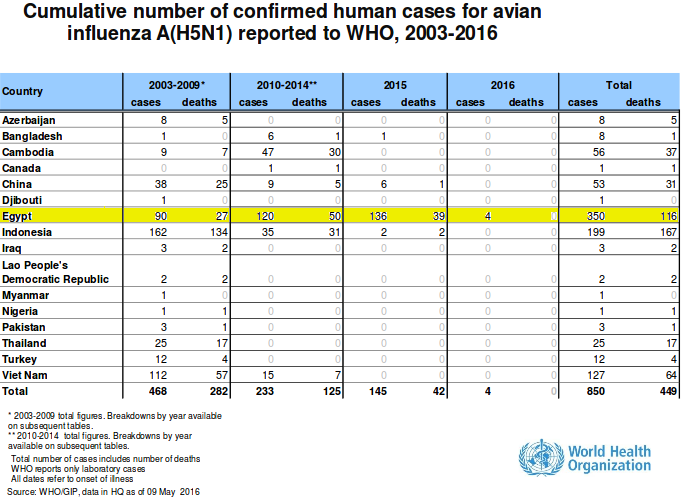 H5N8, which emerged in China and South Korea in 2014, has been reported in Asia, North America, and parts of Europe, but has not yet been reported in the Middle East. Whether due to the introduction of a new H5 subtype, or simply from decreased vaccine effectiveness against H5N1, Egypt's poultry industry is obviously badly shaken by recent avian flu outbreaks. Veterinary sources revealed the existence of confusion at the Department of agriculture, after suspected Bird flu virus in poultry flocks, who destroyed the poultry industry in the United States. The sources said that the faculties of veterinary medicine 500 collected a sample of three provinces: Beni suef and Minya, and sent it to the animal health Research Institute «» to confirm it. Results are due within hours, amid anticipation and concern of the Ministry of agriculture and poultry production sector, a trend to send samples to reference laboratories in Britain, to be sure of the test results, which may cost 5.1 pounds, the General Union of poultry producers asked the Minister of agriculture Dr uitlander, to approve the disbursement of the Fund for the protection of the poultry industry, animal health Research Institute. After that came high mortality in poultry farms by 100% on many farms nationwide, and growing fears that haunt educators currently in case of proven virus killer «h5n8» industry would be a disaster, because there is no vaccine for HIV at all. A big story, if true. But at this time, all we have is media speculation, and so we'll have to await the results of testing.